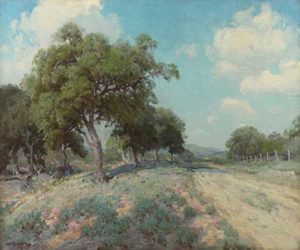 Julian Onderdonk (Am. 1882-1922), Road Through the Trees, 1913-1914, oil on canvas, 25 x 30, signed lower left: Julian Onderdonk. David Dike Fine Art presents the biannual Texas Art Preview & Auction on April 6. The spring sale features 251 lots of early to contemporary Texas art. John Stone, a successful landscape architect and fine art collector for more than 40 years, offers 60 paintings from his private collection. Assembled with passion and adored for many decades, the collection of John Stone is inspired by his love of and work with nature and a deep appreciation for Texas art, ranging from contemporary to traditional works. The spring sale also features fresh works from the estate of Dallas’ own Otis Dozier. Other works by Dallas artists include Olin Travis, Edward Eisenlohr and Merritt Mauzey. In addition, Texas Modernism is represented with works by David Brownlow, Bill Bomar, Seymour Fogel and Zanne Hochberg, the latter of which are from her childrens’ collections. Set at Wildman Art Framing, 1715 Market Center Blvd., Dallas, doors open at 10 a.m. Bidding begins at noon (CST). Auctioneer Louis Murad (TXS 13362) features live, in person, online, phone and absentee bidding. Taco Heads will cater the event, and complimentary valet parking is available on the day of the auction. David Dike Fine Art is located at 2613 Fairmount St. in Dallas. For more information, visit daviddike.com.